Porcelain veneers, which are also called "dental veneers" or simply "veneers", are used to help a number of different dental conditions. If you've been told you need them, you might not know too much about them. What are veneers? How much do porcelain veneers cost? How long are they going to last? When getting any sort of dental work done, having answers to all your questions will make the experience much less stressful. We're going to go over some of the most commonly asked questions about veneers so you can move forward with confidence. 1. How Much Do Porcelain Veneers Cost? Let's start with the reason why you likely looked for this article in the first place: the cost of porcelain veneers. While most insurance plans don't cover veneers, it's not unheard of. Look over your specific insurance plan and contact your insurance company to double check if you have coverage. The cost of veneers is usually done on a per tooth basis. Per tooth, you could be looking at a cost ranging from 1,500 to 1,900 dollars. Veneers are essentially "shells" of thin porcelain that go over your existing tooth. They don't replace your tooth, they simply cover the tooth that's already there. It's kind of like adding fake eyelashes on top of your natural eyelashes. Veneers can be used to conceal and camouflage imperfections in your teeth. These could be cracked teeth, chipped teeth, misshapen teeth, discolored teeth, and more. 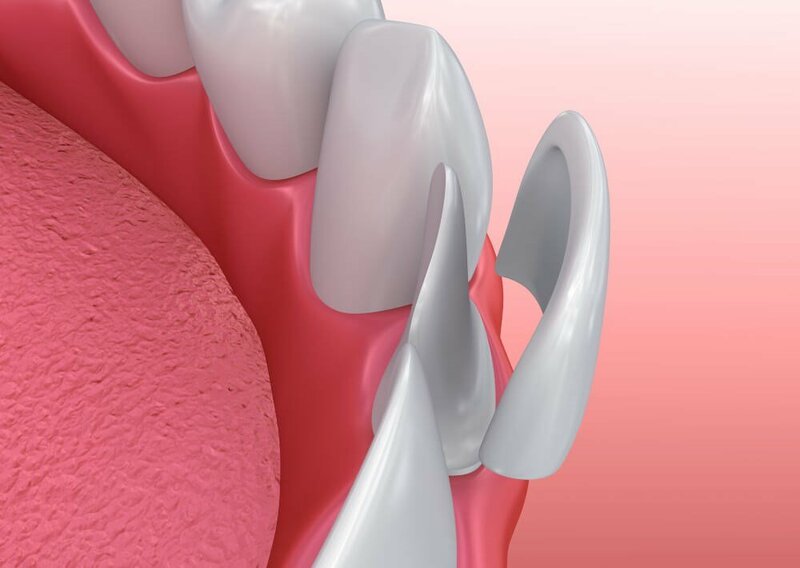 Veneers are specially designed to make your teeth the correct shape, color, and alignment while covering up any imperfections that are on the natural tooth. 4. How Long Do Porcelain Veneers Last? One of the best parts of porcelain veneers is that they last for a long time. They can last anywhere between 7 and 15 years. You'll need to have them inspected by your dentist at check-ups to make sure they're still working as they should. They'll be able to tell you if they need a replacement or not. 5. How Are They Made? Both impressions and photos will be taken of the teeth that are going to be covered with the porcelain veneers. These will be made into specially made wax molds. Before the final veneers are made, you'll be asked to come in and see if the molds fit properly. This is when any adjustments will be made to make sure that the mold fits perfectly to your teeth before it's used to make the porcelain veneers. They're also color matched to your other teeth so it will blend seamlessly with your smile. 6. What Should I Expect When I'm Getting Veneers Put In? Before the veneers are put in place, the dentist will shave off a small layer of your enamel on the teeth where the veneers are going to be put in. They'll then fit you with a set of temporary veneers to make sure that they're what you want and will work with your teeth. Once you're satisfied with the temporary veneers, you'll get the official veneers put in. 7. Do I Need to Do Anything Before Getting Veneers? Before you get the veneers, many dentists recommend getting a full cleaning. This will ensure that they're as clean as possible before the porcelain veneer is put over the enamel of the natural tooth. You can also have them professionally whitened so that they're as white as possible when the veneer is made. You don't want to get a veneer color matched to your teeth only for it to be way too yellow if you get your teeth whitened later. You should also prepare yourself for your new smile: even if it makes your smile looks aesthetically better, it might be a shock to see what looks like a brand new smile in the mirror. Allow yourself at least a few days to get used to the new look. 8. Are There Any Disadvantages to Getting Veneers? There are a few disadvantages to consider. This is a permanent decision: shaving off the enamel of your tooth to put in the veneer isn't something you can reverse. So you need to be sure before you go through with it. Also, this process can be a bit expensive for some people. Veneers are also not repairable should they break or chip, which would mean you'd have to replace the whole thing (another almost 2,000 dollar expense per tooth). 9. Are There Other Options Besides Veneers? Speak with your dentist to see which will work best for you and your budget. 10. Do They Require Special Care? Veneers work like a normal tooth: anything that can break or chip your natural tooth can break or chip your porcelain veneer. So try to avoid super hard foods that could crack or break your teeth and your new veneers. Some dentists also recommend that you wear a liner at night while you sleep to avoid grinding or any damage while you sleep. Veneers are a fantastic way to completely transform your smile. Hopefully, this article helped you answer some common questions about veneers like how much porcelain veneers cost and how you'll have them put in. If you have any more questions that you want to ask, don't hesitate to contact us.